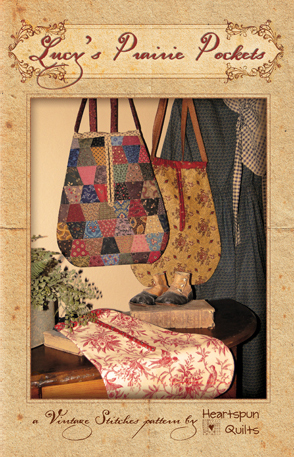 Lucy's Prairie Pockets Pattern ~ NEW from Heartspun Quilts! This nursery rhyme, published in England in 1842, tells of poor Lucy losing her pocket, which was very likely a fabric pocket worn separately, on top of her petticoats, and worn under her skirt or dress. 17th, 18th and 19th century American women made and used these pockets as well, as their clothes contained no sewn-in pockets as we know them today. The pockets were flat, and somewhat U-shaped, that tied around her waist. A slit in the side of her outer skirt allowed the women discreet access to the pocket and its belongings, which lay underneath. Women wore these pockets singly, and in pairs, which helped to accentuate her hips, being the style at the time. Pockets were made from every fabric imaginable. Some were embellished with beautiful crewel and embroidery work, some with patchwork and scraps, and others of plain cloth. Women kept all kind of needful things in their pockets such as letters, books, glasses, etc., and of course, thimbles, needles, thread, and patchwork. At night, they often hung from the bedpost to hold a watch, handkerchief or glasses. Pockets were very much a part of housewifery in early America, and today, we can enjoy making a pocket for our own needful things, to wear as we work, or just to decorate a room. If you love reproducing old, antique quilts, and are a fan of early American life, Journey the Threads of Time R and make a Prairie Pocket for your collection! It's a wonderful way of piecing the past! Pockets come in two sizes. The small pocket measures 6.5 x 8.5 inches, and the large pocket measures 11 x 14 inches. These are historically correct sizes.